Judd Apatow’s films often cover heavy, emotionally complicated territory, but they’re ice cold at the same time. The subject matter is relatable, but the manner in which it’s treated bears little resemblance to real life. (The most egregious offender: “This Is 40.” Now let us never speak of it again.) 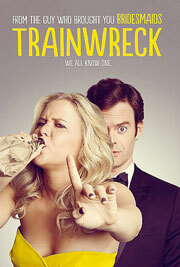 “Trainwreck,” by comparison, is the most honest, heartfelt film Apatow has made to date, and it’s hard not to notice that it’s also the first time he directed a script that he didn’t have a hand in writing. Some back story, for the unfamiliar: Apatow has taken heat over the years for underwriting his female roles – and yes, that criticism came largely from Katherine Heigl, who cashed some monster paychecks after receiving a massive career boost by appearing in his 2007 film “Knocked Up,” therefore people accuse her of biting the hand that fed her, and while that may be the case, she’s not wrong – and perhaps this was Apatow’s attempt to make amends, by directing a script written by a woman (Amy Schumer). The crazy thing is, Schumer’s character in many ways embodies the very traits that Heigl protested (reckless, irresponsible, unaccountable), but with the female character in the lead role, you get something that previous Apatow films never provided, and that is perspective: we get both the ‘what’ and the ‘why’ of her character’s behavior. Also, there are no shrews in this movie. Apatow’s other movies were loaded with shrews. Who likes shrews that much? Amy Townsend (Schumer) writes for S’Nuff, a Gawker-esque magazine with roughly 75% less humanity. She also parties nonstop and sleeps around, even though she has a boyfriend (John Cena). A fellow writer pitches an article about Aaron Conners (Bill Hader), a surgeon who’s come up with a revolutionary knee procedure that will greatly reduce recovery time for athletes. S’Nuff editor Dianna (Tilda Swinton, in full Anna Wintour mode) likes the story, but assigns it to Amy, because Amy has admitted that she hates sports, and Dianna likes the idea of the paradox. Amy surprisingly finds herself fascinated with both Aaron and his work, and when she unprofessionally consummates their professional arrangement, she does unthinkable things, like actually agreeing to spend the night at his place and generally being less afraid of commitment. Amy is confused by this new change to the game plan, and she responds to it the only way she knows how: self-destruction. Before Wes Anderson was a household name (at least among movie buffs), before receiving Oscar nominations for The Royal Tenenbaums, Fantastic Mr. Fox, and Moonrise Kingdom, before The Darjeeling Limited, Rushmore, and The Life Aquatic, yes, before all of that, he and Owen Wilson co-wrote the screenplay for Bottle Rocket. It was based on a short film of the same name they’d made in 1992 and released in 1994. Bottle Rocket was Anderson’s directorial debut and marked the first appearances of Luke and Owen Wilson, as well as their lesser known older brother, Andrew. Leslie Mann, now famous for her many roles in husband Judd Apatow’s films, even had a small part, though it was eventually left on the cutting room floor. Anderson’s first film is an interesting look back at the development of filmmaker’s now signature style: the methodical cinematography, with its bright coloring and compulsive need to center-frame the actors, along with humor so dry you’d better pack a canteen. Though a commercial failure, Bottle Rocket served as a launching pad for the careers of all those names above, so easily recognized here in 2013. But the film is worth a watch on its own merits, even for those who aren’t intrigued by the idea of taking a look at the early work of a couple of future A-listers. Thanks to Anderson’s burgeoning style and its innocent, humorous characters, Bottle Rocket has been certified fresh and holds an 80 percent rating on the TomatoMeter. If that’s not enough to sway you, Martin Scorsese named it his seventh favorite movie of the 1990’s. Yes, that Martin Scorsese. Alright, enough blabber, onto the film itself. Bottle Rocket is a caper comedy about a couple of twenty-something Texans (just like Anderson and the Wilsons were when they made the film) determined to become master thieves. It begins when Dignan (Owen Wilson) aids his best friend Anthony (Luke Wilson) in “escaping” from a mental hospital. In truth, Anthony checked himself in voluntarily and it happens to be the last day of his stay, but he goes along with the charade to please his friend. Dignan, who is both endlessly optimistic and endlessly naive, then shares his “75-year plan” for a glamorous life of crime. Hopefully you’re beginning to see the style of humor the film employs. Dignan’s scheme includes a few small-time heists before meeting with a Mr. Henry (played by James Caan, perhaps best known for his role as Sonny Corleone in The Godfather), whose landscaping business Dignan worked for (and was fired from). Dignan seems to believe Mr. Henry is some kind of criminal mastermind, though whether or not that’s the case remains in question for much of the film, and the truth of the matter is best left unspoiled. Anthony goes along with the idea for much the same reasons he allowed Dignan to “rescue” him from the mental hospital—he doesn’t want to disappoint his friend, who’s oh so excited, and hey, he’s got nothing better to do. Along the way, the two recruit Bob Mapplethorp (Robert Musgrave) as a getaway driver, because he’s the only person they know who owns a car. Although in fact, the car belongs to Bob’s wealthy parents. The eccentric trio endures a great deal of mockery from Bob’s brother, John Mapplethorp, aka Futureman (Andrew Wilson), whenever he crosses their path. After they rob a local bookstore (in hilarious fashion), the guys hide out in a cheap motel near the Mexican border. There begins another major plotline, as Anthony falls in love with a Paraguayan maid named Inez, though she speaks little English and he no Spanish. That alone is a fantastic indication of Anthony’s character, and it makes it all the funnier that he’s the voice of reason in the film’s merry little band of thieves. Bottle Rocket is great entertainment whether you’ve heard of Wes Anderson or not. Dignan, Anthony, and Bob are lovable misfits, and their interactions make for a great deal of subtle, witty humor. If you’re familiar with Anderson’s work and aren’t a fan then this one may not be for you. However, I recommend you check it out nonetheless. He’s the type of director that can take some time and understanding to appreciate. If you’ve put that time in and still don’t like his work, well, there’s no accounting for taste. I mean, anyone who disagrees with Marty freakin’ Scorsese on the subject of film is probably missing the point. Anyway, watch the damn thing and see for yourself. Already available on VOD, “Goon” is one underdog movie we’re definitely rooting for. Loosely inspired by minor league hockey star Doug Smith’s memoir and co-written by Canadian hockey fan Baruchel and veteran Apatow-scribe Evan Goldberg, the film focuses on Doug Glatt (Scott), a goodhearted bouncer of no great intellect who finds himself promoted to full-time hockey thug. Featuring an outstanding supporting cast comprised of Baruchel, Liev Schreiber, Eugene Levy, Kim Coates (“Sons of Anarchy“) and Alison Pill as the dysfunctional love of Doug Glatt’s life, “Goon” doesn’t gloss over the ugliness of sports violence even as it humorously celebrates it. For that, it took some punches from the traditionally violence-averse British press on its earlier UK release. The Yankee press, however, has been kinder, and there may be some hope of a wide release if enough of you hit the initial U.S. screenings starting this Friday. Low-key Minnesota native Seann William Scott, intense Montrealite Jay Baruchel, and matter-of-fact Canadian filmmaker Michael Dowse were still high on the afterglow of a successful industry screening the night before when a bunch of us journos met with the trio at the Beverly Hilton. Some amusing and informative highlights are below. My dad used to have this expression, which was “Don’t complicate a ham sandwich.” In my experience, a lot of the hardest guys I know are also the kindest and most mild-mannered and gentlest. This in no way means that [their kindness] should be mistaken for weakness. He’s a man who knows what he wants, or finds out what he wants and where he’s supposed to be. He’s fulfilled. Seann William Scott on playing Doug Glatt. He’s written to be such a lovable guy and so good to his core. It was written with that specificity and I consider myself to be a good guy, so it’s not hard for me to play that… I was always aware of wanting to make sure there were different colors. Anything that I could bring, but it was already written with that kind of code of honor that he has. He’s self aware of the kind of guy he is and where he is in the world, but it is kind of black and white.